Annual meeting is currently being held at the Ministry of Economic Development and Technology acting as the National Focal Point for the Norwegian Financial Mechanism and the European Economic Area Financial Mechanism where the representatives of the Norwegian Ministry of Foreign Affairs, the Financial Mechanism Office and the Embassy of the Kingdom of Norway and the representatives of the relevant Slovene institutions are discussing the work done thus far and getting acquainted with the future calls for proposals. Five programmes and one fund at the national level have already been approved or will see approval shortly: Global Fund for Decent Work and Tripartite Dialogue, Slovenian Scholarship Fund, Norwegian Financial Mechanism 2009–2014 Programme, European Economic Area Financial Mechanism 2009–2014 Programme, NGO Fund and Fund for Technical Assistance and Strengthening of Bilateral Relations at National Level. • Conservation and Revitalisation of Cultural and Natural Heritage with the objective to safeguard and conserve cultural and natural heritage for future generations and make it publicly accessible. • Biodiversity and Ecosystem Services with the objective to halt loss of biodiversity and improve consistency with the environmental legislation (expected outcomes are increased capacity to manage and monitor the Natura 2000 sites effectively, avoided fragmentation of ecosystems, increased awareness of and education in biodiversity and ecosystem services, including awareness of and education in the linkage between biodiversity and climate change, and economic valuation of ecosystems). • Public Health Initiatives with a view of improving public health and reducing inequalities in health (expected outcomes are reduced inequalities between user groups, reduced or prevented lifestyle-related diseases and improved local capacity for mental health services through establishment of new structures). The second call for proposals will target small projects in the area of Mainstreaming Gender Equality and Promoting Work-Life Balance. 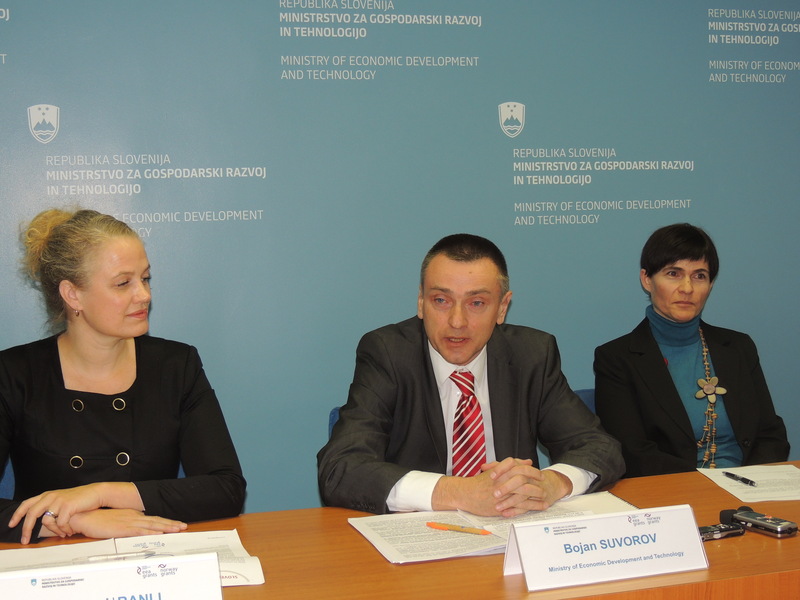 This involves the so-called small grant scheme which will make available a little less than 1 million EUR. The aim of the projects will be to improve the gender equality situation in order to correspond to the equal opportunity policy at the national and European level – equal awareness of, empowerment and participation of both genders in all spheres of life, both public and private. The expected outcomes are awareness raised and research on gender issues, improved balance between work, private and family life, and balanced representation of both genders in decision-making and leading positions in the economy and politics. Two pre-defined projects in the framework of the Norwegian Financial Mechanism 2009-2014 will be implemented by the Institute of Public Health of the Republic of Slovenia in the area of public health and by the Ministry of Labour, Family and Social Affairs in the area of equal opportunities. Environmental monitoring and integrated planning and control under the European Economic Area Financial Mechanism Programme will be a pre-defined project implemented by the Surveying and Mapping Authority of the Republic of Slovenia with the overall objective to modernise the infrastructure for spatial information to reduce flood risks and the impacts of floods. Director of the Centre of the Republic of Slovenia for Mobility and European Educational and Training Programmes (CMEPIUS), Alenka Flander presented the Slovenian Scholarship Fund which primarily promotes international mobility and strengthening of inter-institutional cooperation between Donor States and Slovenia. A total of 2 million EUR has been made available for different activities in this period. The representative of the Donor State – the Norwegian Ministry of Foreign Affairs – Mette Jøranli stressed out that these programmes play an important role in strengthening bilateral ties between the two countries. She particularly highlighted cooperation in the areas of health and strengthening of the NGO sector. According to Ms Jøranli, Norway wishes to remain a credible partner for Slovenia, and she is convinced that future cooperation will be productive as it will build on positive experience from the previous programming area.